Israeli estimates of the number of missiles terrorist powerhouse Hizballah has in Lebanon increased last summer from 100,000 to 150,000. The Shi'ite army continues to gain strength, unhindered by the token presence of United Nations troops in what was supposed to be a de-militarized zone following the 2006 Second Lebanon War. Hizballah's promises of capturing the Galilee – that have inspired a feature-length Lebanese movie on the subject – are oft-repeated. The imminent release (as a result of the P5+1 nuclear deal) of billions of dollars to its guardian angel and guiding hand, the Islamic Republic of Iran, promise more money and materiel will be placed at the disposal of an organization that has already fought two vicious wars against the Jewish state, a state whose existence it refuses to recognize. Hizballah's growing strength, and its acquisition of advanced weapons, (undoubtedly aided of late by Russian air strikes in support of the Syrian army), has Israeli leaders thinking hard about how long they can allow such a build-up to go unchecked, and whether there is a growing case for something more than sporadic cross-border interventions to temporarily stem Hizballah's growing firepower. "We operate in Syria from time to time to prevent it turning into another front against us," Israeli Prime Minister Benjamin Netanyahu acknowledged Dec. 1 at the Galilee Conference in Acre. "We act, of course, to prevent the transfer of deadly weaponry from Syria to Lebanon." His surprise comments came on the back of two reported airstrikes on Syrian weapons convoys – attributed to the IAF – apparently destined for Hizballah. Two days later, Defense Minister Moshe Ya'alon again highlighted the increasing danger posed by Iran's overt support of the Hizballah, telling members of the U.S. Congress, "We are very worried about Iran's presence in Syria... This regime generates terrorism and undermines many of the regimes in the Middle East, and this is not good news for the region, not only Israel." Reports last week of Iran completing a second medium-range ballistic missile test in contravention of U.N. Security Council resolutions did little to ease Israeli fears. On Dec. 10, in another indication of the urgency with which it views the Iran-Hizballah threat, Israel successfully tested its Arrow 3 missile defense system, an extra layer of defense on top of the Iron Dome, David's Sling, and the Arrow 2 system that may well prove critical in defending against the Iranian-made Shihab 3 longer ranger missiles. In an exclusive interview with the Investigative Project on Terrorism, a senior IDF official – who for security reason must remain anonymous – spelled out the likely scenario should Hizballah live up to its promises and attack Israel from the north. He did not discuss the likelihood of an Israeli pre-emptive strike against Hizballah, but painted a sometimes grim assessment of what the Israeli public can expect. "The next war will be different. As an Israeli citizen, father to two boys in the army, I really hope we will find a solution to peace in the area... but we have to deal with this," the IDF official explained. "I believe that in the next war we will see that Hizballah and Hamas will both launch missiles. They have the same interest here." Earlier this month, subsequent to this interview taking place, Israel's Channel 2 news reported that Shadi el-Meni, the Islamic State leader in the Sinai Peninsula, met with Hamas leaders to discuss increased weapons supplies to the Gaza-based terrorists. The ideological differences between the two sides seemingly set aside in the pursuit of preparing an enhanced assault on Israel. The IDF officer suggested that during the 2014 Gaza War more than 70 percent of the Israeli population was covered by the Iron Dome as it intercepted missiles coming from the Hamas-controlled enclave. But with rockets raining down from Israel's north and south, Iron Dome's use would be limited. There will be occasions when civilians will not be protected when defending strategic installations take priority. "We understand that Iron Dome next time will not do the same work," he said, "because you will not always put it on populations; you will put it in strategic locations that we need to defend like chemical factories, and gas [installations], of course." Israel's third largest metropolitan area, Haifa, is home to a huge Mediterranean port and a major Israeli naval base. Defending such a massive target will be "very hard" he said. "We have Iron Dome, the Arrow and the Patriot as well, but when you have 150,000 missiles from Lebanon, you cannot assume that every missile they will launch will [be intercepted]. This is what we need to explain to the Israeli population. A lot of [apartment blocks], a lot of industrial zones, a lot of factories will be targeted, and at the same time Hamas will launch from Gaza. This is our understanding." He suggested there will be sustained bouts of simultaneous rocket attacks in the north, although there is no doubt that Hizballah's arsenal offers the capability to reach as far as Tel Aviv and Jerusalem. "I think the enemy has [learned] very well. Today we see Hizballah fighting in Syria. Hizballah a few years ago said they are just defensive, now we see they are an offensive force. After the  operations near Israel's Gaza border, we understand that kibbutzim near the [Lebanese] border may be 'evacuated and moved back.' We think it is possible [Haifa] will be without electricity for 72 hours," he continued. "No phones. No talking to your family. We have practiced evacuations to shelters and built civilians rescue teams in the towns and villages." Civilian teams have trained to help get people into shelters and in emergency response in Jewish towns and Arab villages alike. Haifa, for example, is home to a wide variety of communities, including around 30,000 Israeli Arabs, (both Muslim and Christian), Druze, and followers of the Baha'i faith. "We assume everything Hizballah sees in Syria they can try to bring into Lebanon, so I assume that they will try to bring missiles such as Scuds and try and launch them all over Israel. 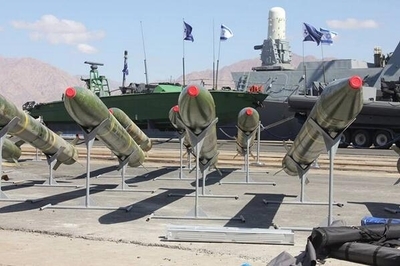 In [the Haifa] district what we will see is the 122mm – they have thousands of these Katyushas that have a range of up to 45 kms - and that would take them from the [Lebanese] border to Tirat HaCarmel [on the south side of Haifa]. This is the main problem for the first days of the war." "Hizballah has advanced weapons. You don't need to be in uniform to know that if they take the C-802 that they launched at Eilat in 2006 they will try launching it [again]. They have very good, advanced weapons, anti-tank missiles – a huge stockpile." And, under the cover of missile fire, the senior IDF officer said he has little doubt Hizballah will attempt some degree of land invasion. "I think that there are maps of this," he said. "We understand this when [Hizballah leader Hassan] Nasrallah says he will be in the Galilee and will take it from Israel. I don't think that he will [achieve] it. So, they will take Metula, or Shlomi, or Hanita for a few hours and they'll raise a flag. Okay, so they will launch thousands of rockets. It will be hard, but Israel will continue to exist. With Hizballah fighting in Syria in offensive attacks with tanks, infantry, UAV's, you understand they are building a very powerful military with much practical experience." During the long and bloody fight against ISIS, Al Nusra and others in Syria, Hizballah has picked up large amounts of weaponry from the battlefield, weapons manufactured around the globe, some likely from the U.S. who have armed the Free Syrian Army. Whatever they captured could be fired on Israel when the war everyone expects finally breaks out. With the exception of its border with Jordan, Israel faces non-state actors at all points of the compass. Hizballah in south Lebanon, Hizballah, ISIS and the Al Nusra Front in Syria, Hamas and Islamic Jihad in Gaza, and ISIS and al-Qaida in Sinai. There are also signs that the Fatah-run Palestinian Authority is increasingly vulnerable to radical Islamists from Hamas or ISIS as the stabbing terror spree against Israelis continues into a third month. Could the awful Paris attacks in November have finally brought Europeans around to understanding the Israeli predicament in facing terror organizations on virtually all sides? "I think that all over the world we have problems with radical Muslims. What we see... is a common enemy. These radical terror organizations have similar tactics and I hope the world will understand what Israel has [faced] in the last decades. I think maybe we don't know how to explain our story [very well]. I hope that maybe now they will understand what a threat the world has, facing non-state actors and terrorist organizations - and we know it is Iran that gives money to Hizballah and tries to give them missiles to hit every place in Israel." The best opportunity for Israel to intervene might have presented itself last summer, when Hizballah appeared to be on the ropes. "One can conclude that Israel may see an auspicious opportunity to make a preemptive attack to destroy Hezbollah's massive ordnance in southern Lebanon, stockpiled since the 33-day Israel-Hezbollah war in 2006," Iranian-Canadian political analyst Shair Shahidsaless wrote at the Huffington Post in June. Israel is facing life-&-death decisions. Not just in their neighborhood but in Iran. Presumably Israel must know what the timing is in Iran and how much longer they can afford to wait. If feasible they should hit Hezbollah and the nuclear facilities in Iran at the same time. They may need to drop on Iran the very type of bombs that Iran is presently building. Or, of course, they can don their blinders as many Europeans and Americans and Canadians have done and wait for their final destruction or do a repeat Masada..